All is set for today’s AFCON Under-20 Nations Cup qualifier between the Sudanese National Under-20 team and Nigeria’s Flying Eagles. The seven time African champions arrived Sudan late on Friday but found just enough time to train under floodlight on the artificial pitch beside the Sudan Football Federation premises. The match will kick off at 8pm Sudanese time (6pm Nigerian time) on Sunday with the Flying Eagles dressed in an all white outfit while Sudan will be on their traditional all red jersey. Full Time: Sudan 1-2 Nigeria. 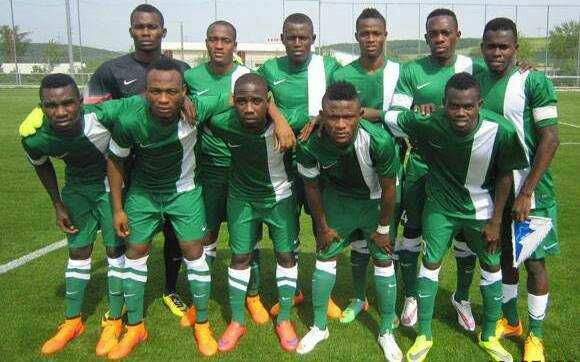 Super performance from the Flying Eagles, they battle Sudan again in a forthnight. 63′ Substitution: Kingsley Michael IN, Orji Okonkwo OUT. 36′ YELLOW CARD. Ikwu is booked for rough tackle. 22′ Gavi Thompson beats the last man, but his effort is saved by Sudan Goalkeeper.